Saving Animals & Healing Hearts received a Senate Certificate of Recognition from Senator Joel Anderson on behalf of the state! An article about it was published in the East County Gazette. Follow the link below to read the article (Page 3). Wow, what a crazy 24 hours we have had. 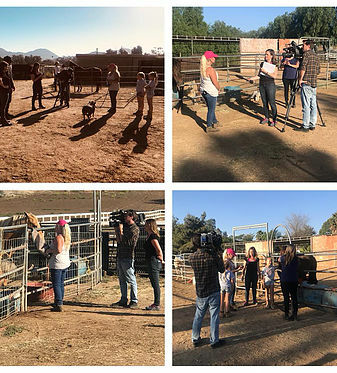 Channel 8 news came out to visit the ranch today to do a story on Saving Animals & Healing Hearts. What an exciting experience. I've never seen how the news stories are created. From filming to publishing the segment it was quite an eye opening ordeal. I was no less than amazed at how the reporter Abbie Alford and the camera guy Hank made everyone feel comfortable and I pretty much forgot it was being filmed at times. Then they actually put it together and streamed it to the station just before airing. I was really impressed. Blown away was more like it I cannot thank them enough for their efforts. The response has been fantastic and I really hope it continues. Please keep sharing our story, help us grow our community so we can rally together and help save more animals! If you missed the segment, follow the link below.